Several types of tray are used in different applications. A solid-bottom tray provides the maximum protection to cables, but requires cutting the tray or using fittings to enter or exit cables. A deep, solid enclosure for cables is called a cable channel or cable trough. A ventilated tray has openings in the bottom of the tray, allowing some air circulation around the cables, water drainage, and allowing some dust to fall through the tray. Small cables may exit the tray through the ventilation openings, which may be either slots or holes punched in the bottom. A ladder tray has the cables supported by a traverse bar, similarly to the rungs of a ladder, at regular intervals on the order of 4 to 12 inches (100 to 300 mm). Ladder and ventilated trays may have solid covers to protect cables from falling objects, dust, and water. Tray covers for use outdoors or in dusty locations may have a peaked shape to shed debris including dust, ice or snow. 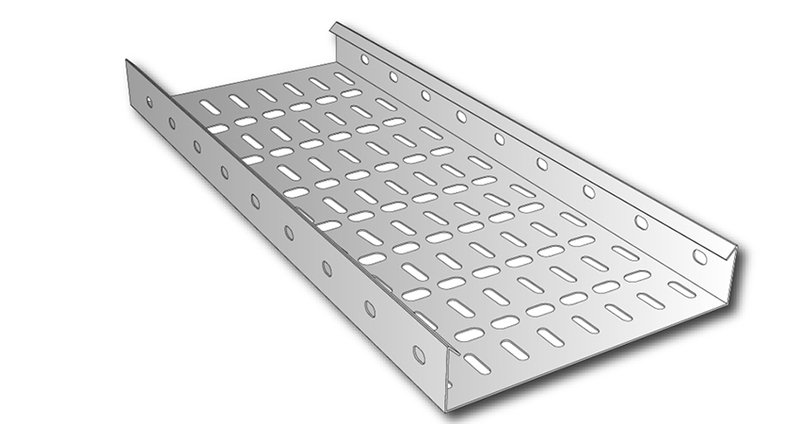 Lighter cable trays are more appropriate in situations where a great number of small cables are used, such as for telephone or computer network cables. These trays may be made of wire mesh, called "cable basket",or be designed in the form of a single central spine (rail) with ribs to support the cable on either side. Large power cables laid in the tray may require support blocks to maintain spacing between conductors, to prevent overheating of the wires. Smaller cables may be laid unsecured in horizontal trays, or secured with cable ties to the bottom of vertically mounted trays. To maintain support of cables at changes of elevation or direction of a tray, a large number of specialized cable tray fittings are made compatible with each style and manufacturer. Horizontal elbows change direction of a tray in the same plane as the bottom of the tray and are made in 30, 45 and 90 degree forms; inside and outside elbows are for changes perpendicular to the tray bottom. These can be in various shapes including tees and crosses. Some manufacturers and types provide adjustable elbows, useful for field-fitting a tray around obstacles or around irregular shapes. Various clamping, supporting and splicing accessories are used with the cable tray to provide a complete functional tray system. For example, different sizes of cable tray used within one run can be connected with reducers.